from STEWC presentation by Chris Buchanan, November 17, 2012. The campaign trail is heating up as the campaign season winds down. TV 5 has been featuring the three major candidates running to replace Sen. Olympia Snowe in the U.S. senate. We asked our Facebook fans to post questions, and we then posed those to Angus King, Cynthia Dill and Charlie Summers. Do you support the proposed East West Highway in Maine? Why or why not? Development in western Oregon and southwest Washington has largely swapped forests for homes, driving down water quality and quickly killing off some species of mayflies and other sensitive insects that rely on relatively pristine streams, a new study from the U.S. Geological Survey finds. USGS researchers examined nine broad urban regions across the United States for their study, released today. In the Northwest, they tapped into 28 measuring stations from Cottage Grove, south of Eugene, to Battle Ground, north of Vancouver, covering the Willamette Valley and the Portland region. Forests start off with a greater diversity of species and better water quality than agricultural lands, said USGS scientist and study co-author James F. Coles. So regions that focus development on former forest land, including western Oregon, saw the sharpest quality declines, Coles said. Paving over forestland denudes streamsides and increases runoff from storms. More rainwater gushes into streams, carrying pesticides, fertilizer and sediment and increasing water temperatures, all threats to aquatic life. The Oregon and Massachusetts study areas saw the biggest decline in “sensitive invertebrate species,” the study found, including mayflies, stoneflies and caddisflies, insects familiar to fishermen and long used as indicators of stream health. They decline sharply even in the initial stages of urban development, the researchers said. The study highlights the need for forest conservation, the researchers said. Other solutions, many being pursued in the Northwest, include planting trees, installing pervious pavement and increasing buffer zones around streams. ASTORIA — They appear suddenly in mid- to late summer, flushed by tides into the mouth of the Columbia River. Soaking up the warm sun, they multiply like crazy. Sometimes crimson, sometimes the deep red of a hearty cabernet, they paint dramatic swirls of color in the estuary between Oregon and Washington. No one knows exactly when these algae first swarmed into the waterway. But this year they appeared to be more abundant than ever, and they stuck around, showing up in early September and staying through last week. “This year it seems to have persisted for quite a long time,” said Peter Zuber, lead investigator of a study on the algae at the Portland-based Center for Coastal Margin Observation & Prediction. The algae stun visitors, stymie fishermen and occasionally worry residents, who fear they’re creating a toxic red tide harmful to fish. But for scientists trying to unravel their secrets, they’re an enigma. When did they first show up in force and why do they return annually? How can they survive the thrashing of ocean waters that sweep into the estuary? What eats them, if anything? What happens when they die? What role do they play in the coastal ecosystem? What researchers do know is that these single-cell organisms are not toxic and may even be an environmental blessing, acting as a kind of counterweight to negative forces of climate change by spewing oxygen into depleted waters. Against the braying of sea lions lounging on piers, the dark waters off Astoria glistened in the late morning sun on a recent Wednesday. Pelicans swooped for fish, and a lone seal bobbed in the currents as two scientists launched a torpedo-like device into the north channel of the Columbia. The 4-foot-long black, white and yellow vehicle with an orange fin slipped into the water, whirred, then whizzed into the deep. Underwater, it searched a grid pattern marked by pinging beacons. The device amassed data on everything from currents, the temperature and salinity of the water to the concentration of oxygen and pigments. The data will help paint a picture of the density of the algae throughout the estuary. Though the algae form thickets, they’re not easy to track. They dance vertically and swim rapidly. Never stationary, they form patches that hover and streak through the water. “This is an extremely complex system that we’re trying to understand,” said Craig McNeil, senior oceanographer at the University of Washington and an investigator on the algae project. By studying the algae, researchers eventually hope to gain a glimpse of how global warming might affect coastal waters so crucial to the food supply, livelihoods and recreation. The algae — Mesodinium rubrum — are not a new phenomenon. They’ve been sighted off the coast of British Columbia, Chile, Peru, Britain and Denmark. But they’ve not drawn bundles of research dollars, partly because they’re not toxic and pose no obvious threat. “Trying to get money to study them is not straightforward,” said Tawnya Peterson, a scientist with the Center for Coastal Margin Observation & Prediction, based at Oregon Health & Science University and including researchers from UW and Oregon State University. Mostly they’ve been seen as a curiosity, though they could be much more than that. Unlike other phytoplankton, they cannot absorb carbon dioxide or churn out oxygen on their own. They eat other algae and steal their pigments or chloroplasts, which are essential to photosynthesis. “It’s kind of like farming,” Peterson said. This mechanism allows them to multiply, or bloom, at an amazing rate. When they’re in full bloom, they infuse the water with dissolved oxygen that salmon, for example, need to survive. They’re speed champions, traveling great distances by jumping through the water like aquatic fleas. They’re also an attractive species viewed through a microscope, according to Rachel Golda, a graduate student at OHSU who’s studying the algae under Peterson and another scientist at the center. Not everyone shares Golda’s fascination. Ken Rieck, 75, has been fishing in the Columbia since 1968. He first noticed the red algae about a decade ago. He said the red water has made fishing more difficult. He steers around a bloom when he can. Divers inspecting the Astoria-Megler Bridge avoid the algae as well. Surfers and kayakers have observed the bloom, and residents have talked about it. Spencer Gotter, head brewer at Fort George Brewery, decided to play homage to the algae with a special high-octane blend: Red Tide Imperial Ale. It was sold on tap this year next to Flanders Nut Red, Roscoe IPA, Quit Wit and other brews. Packing a punch, it’s served in a brandy snifter to heighten its citrus aroma. “It’s got an 8.5 percent alcohol content and it’s chock full of Centennial hops — they’re delicious,” said Gotter, who created the red tide ale last August. The brew is a hit with customers, even if the algae blooms are not. Shannon Meeker, a server at the brewery, said some worry about eating oysters when the Columbia turns red. 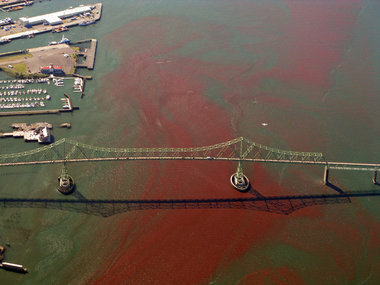 Most people associate red tides with fish kills in places like the Gulf of Mexico, where one species of algae releases toxins that paralyze the central nervous system of fish. 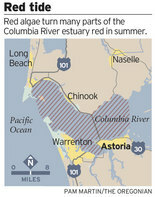 Other algae have created dead zones off the coast of Oregon. When those algae die, they increase carbon dioxide levels and lower the amount of oxygen. But Mesodinium rubrum — the algae staining the Columbia — have the opposite effect: They take in carbon dioxide and spew out oxygen. Curtis Roegner, a scientist at the National Oceanic and Atmospheric Administration, said the bloom appears to offset low oxygen levels in the Columbia caused by waters washed in from the ocean. “When we have the bloom, it looks like it can ameliorate this effect,” Roegner said. That’s good for harvests of fish and shellfish, which are threatened by reduced levels of oxygen. Those creatures are also threatened by ocean acidification associated with rising levels of carbon dioxide from global warming. Oyster larvae, for example, can’t grow shells in water with a low pH. “It’s a huge worry,” said Golda, the graduate student. She’s working on a project looking at a possible link between the algae and ocean acidification. She suspects the algae thrive in more acidic water. It could be years, even decades before scientists have a solid understanding of these simple yet perplexing organisms. Although they are not going to halt global warming, they may play a part on a micro scale, Golda said. E/W Alert! Canada to send Tar Sands Oil East, all articles here! Defending Water for Life in Maine and Stop the East-West Corridor members have anticipated exposure of the link between tar-sands oil and the East-West Corridor due to pressure to get the oil from Alberta to east coast ports. While other environmental groups are focused on opposing the reversal of the Portland-Montreal Enbridge pipeline to transport tar sands from Montreal to Portland, we believe the East-West Corridor is a very viable option for this highly competitive industry. While Exxon/Mobil wants Enbridge, TransCanada wants another route to the Atlantic. Now, Canada has expressed a desire to ship tar-sands oil to Irving’s refinery in St. John’s, placing tremendous pressure on the development of the East-West Corridor through Maine. Update article (11-14-12): TransCanada does not foresee major resistance to eastern oil pipe proposal. Update article (11-8-12): Line 9 – Shipping Tar Sands Crude East. Update articles (10-31-12): Eastern oil pipeline proposal technically, economically feasible: TransCanada. Update article (10-31-12): TransCanada promotes crude solution. Update article (10-12-12): LePage and the Maine DEP have met behind closed doors with Tar-Sands companies.